Draft: 2008, Los Angeles Dodgers, 11th rd. Full name is Nathan Edward Eovaldi ... Last name is pronounced "ee-VAHL-dee." ... Signed by Chris Smith (Dodgers) ... Is married with 2 children ... Graduated in 2008 from Alvin (TX) High School ... Underwent Tommy John surgery as a junior on 5/27/07, performed by Dr. David Lintner ... Recovered in time to pitch as a senior ... Grew up in Alvin, TX, the same hometown as Hall of Famer Nolan Ryan ... Both pitchers attended Alvin High School, but they did not meet until 2016, when the Yankees visited the Astros. In 22 appearances (21 starts) between TB and BOS, went 6-7 with a 3.81 ERA (47 ER/111.0 IP), a 1.13 WHIP, 101 SO, and only 20 BB ... Returned to the majors after missing all of 2017 recovering from Tommy John surgery performed in 2016 ... Among AL pitchers with 20+ starts, held the 4th-lowest BB/9.0 IP ratio (1.62) and 5th-highest SO/BB ratio (5.05) ... Made 6 scoreless starts of 6.0+ innings ... In 5 of his starts, threw 6.0+ innings and allowed 0 runs and 3 or fewer hits, tied with Corey Kluber and Justin Verlander for the most such starts in the AL ... Led the majors with 4 starts in which he threw 6.0+ scoreless innings and allowed 2 hits or fewer ... Also led MLB with 3 starts in which he recorded 6.0+ scoreless innings and surrendered 1 or 0 hits ... Allowed 0 HR to his final 194 right-handed hitters faced, including the postseason ... From 9/1 through the end of the World Series, left-handed hitters were 4-for-53 (.075) against him ... Including the postseason, made 4 starts against the Yankees as a member of the Red Sox ... In those games, posted a 0.39 ERA and held batters to a .367 OPS (23.0 IP, 1 ER, 11-for-77, 0 HR, 18 SO, 3 BB) ... Made his season debut on 5/30 at OAK, his 1st ML appearance since 8/10/16 ... Threw 6.0 scoreless, hitless innings in a 6-0 Rays win ... Allowed only 1 hit and 0 runs on 6/26 vs. WSH (6.0 IP) and again on 7/8 at NYM (7.0 IP) ... Made his final start with the Rays on 7/20 vs. MIA and allowed 1 run in 6.0 IP ... After being acquired on 7/25 from TB, went 3-3 with a 3.33 ERA (20 ER/54.0 IP) over 12 appearances (11 starts) with the Red Sox in his debut with the club ... Between the 2 clubs, held a career-best 19.0-inning scoreless streak from 7/20-8/10 ... Earned the win in each of his first 2 starts with BOS, combining to toss 15.0 consecutive scoreless innings ... Became the 1st pitcher to begin a Red Sox career with a 15.0-inning scoreless streak-all as a starter- since Vaughn Eshelman in 1995 (18.0 IP) ... Was the 3rd Red Sox pitcher in the last 100 seasons to hold his opponent scoreless in each of his first 2 starts with the club ... Joined Dave "Boo" Ferris in 1945 (4/29- 5/6) and Vaughn Eshelman in 1995 (5/2-7) ... Tossed 7.0 scoreless innings in his Red Sox debut on 7/29 vs. MIN (4 H, 5 SO) ... Threw just 82 pitches ... Prior to Eovaldi, the last Red Sox pitcher with 0 BB over 7.0+ scoreless IP in his team debut was King Brady on 10/5/1908 vs. the New York Highlanders ... Logged a career-high-tying 8.0 scoreless IP in his 2nd start with the club on 8/4 vs. NYY (3 H, BB, 4 SO) ... Faced the minimum number of batters through 5.0 IP ... Threw 3.1 scoreless innings on 9/3 at ATL on 2 days rest ... Issued 4 BB, snapping a career-long streak of 22 consecutive starts with 2 BB or fewer ... Was the 3rd-longest active streak in the majors entering play ... Allowed 2 R over 3.2 relief IP on 9/11 vs. TOR ... Was his 1st relief appearance since 7/19/16 with NYY at BOS ... Held NYY to 2 hits over 6.0 scoreless innings on 9/18 at Yankee Stadium ... Became the 1st Red Sox with consecutive scoreless starts vs. NYY since Josh Beckett in 2011 (2, 4/10-5/14) ... Limited NYY to 3 hits on 8/4 and 2 hits on 9/18.. ... Became the 1st Red Sox with consecutive scoreless starts with 3 hits or fewer allowed vs. NYY since Smoky Joe Wood in 1911 ... Struck out a career-high-tying 10 batters over 5.0 IP on 9/24 vs. BAL (4 H, R) ... Marked his 1st game with 10+ SO since 5/5/14 with MIA vs. NYM ... Limited NYY to 1 hit and 1 unearned run over 2.0 IP during his final start on 9/29 at Fenway, striking out 4 ... POSTSEASON: In his postseason debut, won both of his starts and made 4 relief appearances, posting a 1.61 ERA (4 ER/22.1 IP) with 16 SO and 3 BB ... Started and won Game 3 of the ALDS at Yankee Stadium (7.0 IP, 5 H, 1 R, 0 BB, 5 SO) ... Became the 7th Red Sox pitcher to throw 7.0+ innings, issue 0 BB, and give up 1 or 0 runs in a postseason game, and only the 4th Sox pitcher to do so in the Live Ball Era (most recent: Jon Lester, 2013 World Series-G5 at STL) ... Also became the 20th pitcher in MLB history to throw 7.0+ innings, issue 0 BB, and allow 1 or 0 runs in a postseason debut (last: Jake Arrieta in 2005), the 3rd Sox pitcher to do so (also Dutch Leonard and Rube Foster in 1915) ... Became the 8th pitcher to throw 7.0+ innings, issue 0 BB, and allow 1 or 0 runs in a postseason game on the road against NYY (last: BAL's Miguel Gonzalez, 2012 ALDS-G3) ... Started and won Game 3 of the ALCS at Minute Maid Park (6.0 IP, 6 H, 2 R, 2 BB, 4 SO) ... Became the 4th pitcher to throw 6.0+ innings and allow 2 runs or fewer in each of his first 2 career postseason outings, both for BOS ... The others are Dutch Leonard (1915-16), Babe Ruth (1916-18), and Jim Lonborg (1967) ... Threw 1.1 scoreless innings in the Sox' pennant-clinching win over HOU in Game 5 of the ALCS ... Recorded a perfect 8th inning in Game 1 of the World Series and again in Game 2 ... In Game 3 of the World Series at Dodger Stadium, started the 12th inning and pitched the remainder of the game for BOS ... Allowed 1 run from the 12th-17th innings before allowing a walk-off HR to Max Muncy in the 18th ... Became the 43rd pitcher to throw 6.0+ innings of relief in a postseason game (35th in a World Series game) ... The only other Red Sox to throw 6.0+ innings of relief in a playoff game are Pedro Martinez (6.0, 1999 ALDS-G5), Charley Hall (8.0, 1912 WS-G7), Ray Collins (7.0, 1912 WS-G6), and Cy Young (7.0, 1903 WS-G3). Spent the entire season rehabbing from a second Tommy John surgery…is attempting to become the 32nd player to pitch in the majors after two Tommy John surgeries, and only the 12th pitcher to start a major league game after doing so…could become the third to pitch for the Rays after two Tommy John surgeries, following Al Reyes and Lance Carter, and the first to start a game for the Rays.... On Sep 9, returned to strike out a pair in a scoreless inning of a rehab start…threw 10 pitches (9 strikes) in Game 4 of the Southern League Finals for Double-A Montgomery... Also made a relief app in the postseason for Triple-A Durham, pitching a scoreless inning in Game 2 of the Governors' Cup against Scranton/ Wilkes-Barre (Yankees). Made 24 apps (21 starts) for the Yankees…moved to the bullpen after going 6-6 with a 5.54 ERA (91-IP, 56-ER) in 16 starts through July 1…returned to the rotation on July 19 and went 2-2 with a 3.46 ERA (26-IP, 10-ER) in 5 starts before his season-ending injury. According to FanGraphs, averaged 97.1 mph on his fastball, 2nd hardest in the majors (min. 100 IP) to NYM Noah Syndergaard (98.0)…according to PITCHf/x, threw 36 pitches of at least 100 mph…topped out at 101.4 mph. Won 5 straight starts from May 7-29 and 6 straight decisions from April 25-May 29. Went 5-0 with a 3.25 ERA (36-IP, 13-ER) over 6 starts in May, tied for the AL lead in wins. Had at least 7 SO in 7 consecutive starts from Aug 19, 2015-April 20, 2016, tied for the longest streak in Yankees history with CC Sabathia (2011, 2009), Mike Mussina (2003) and Ron Guidry (1978). Yielded 4 ER or more in 6 straight starts from June 3-July 1 before moving to the bullpen…made 3 apps in relief, his first action out of the bullpen since his rookie season in 2011. On April 25 at TEX, had the longest no-hit bid of his career before allowing a leadoff, 7th-inning single to Nomar Mazara. On May 18 at ARI, yielded a leadoff double to start the game before retiring his final 18 BF…was the first Yankees pitcher to go at least 6 IP and allow 1 baserunner or fewer since Mike Mussina lost his perfect game after 26 BF on Sep 2, 2001 at BOS. On July 10 at CLE, went 4.1 IP out of the bullpen to tie for the longest relief app by a Yankee in 2016…didn't allow a run in the 11-7 win. Placed on the 15-day DL on Aug 12 (retroactive to Aug 11) with a right elbow tendon injury…was the second straight year his season was cut short by a right elbow injury. Went 14-3 with a 4.20 ERA (154.1IP, 72ER) in 27 starts in his first season with the Yankees before he was shut down for the season following his 9/5 start with right elbow inflammation…set a career high in wins, nearly doubling his career win total entering the year (went 15-35 from 2011-14)…the Yankees went 18-9 in his 27 starts...Finished tied for eighth in the AL in wins…recorded a career-high 3.1 WAR (FanGraphs), 12th among AL pitchers…his 3.42 FIP was ninth-best in the AL (min. 150.0IP)…posted a 3.81 xFIP...His .824 winning percentage led the AL and ranked second in the Majors (min. 15 decisions) to Los Angeles-NL's Zack Greinke (.864, 19-3)…he and Greinke were the only two pitchers who made at least 25 starts in 2015 and took three losses or fewer…posted the fourth-highest winning pct. among Yankees pitchers with at least 15 decisions in a season in the expansion era (since 1969), behind Ron Guidry-1978 (25-3, .893), Ron Davis-1979 (14-2, .875) and Roger Clemens-2001 (20-3, .870)...Posted a career-long nine-game winning streak and 13-start unbeaten streak from 6/20-8/30…marked the longest winning streak in the AL and tied for the second-longest in the Majors in 2015…had a 3.32 ERA (78.2IP, 29ER) during the streak…marked the longest single-season winning streak by a Yankee since Ivan Nova won 12 straight decisions from 6/10-9/20/11…his 13-start streak of non-losing starts was the longest in the AL in 2015 and tied for the second-longest in the Majors behind San Diego's James Shields (14 starts)…was the longest by a Yankee since Nova's 20-start unbeaten streak from 6/10/11-4/27/12...Went 5-1 with a 3.22 ERA (78.1IP, 28ER) in 13 home starts…was unbeaten in his first 12 home starts before taking a loss in his final start of the year on 9/5 vs. Tampa Bay…his 12-start home unbeaten streak was tied for the secondlongest in the Majors behind Houston's Dallas Keuchel (18 straight), and the second-longest season-opening streak in the Majors (Keuchel-18)…was the longest home unbeaten streak by a Yankee since CC Sabathia (21 straight) from 7/18/09-9/2/10 and the longest to begin a season since Sabathia's first 14 starts of 2010...Went 9-2 with a 5.21 ERA (76.0IP, 44ER) in 14 road starts…was tied for second in the AL and tied for fifth in the Majors in road wins…marked the most road wins by a Yankee since CC Sabathia (11) in 2011…set a career high by winning his final seven road starts beg. 6/26, going 7-0 with a 4.24 ERA (40.1IP, 19ER) during the streak…marked the longest streak of consecutive winning road starts in the Majors since Kansas City's James Shields (seven straight) from 7/26-9/27/13…was tied for the fifth-longest such streak by a Yankees pitcher since 1914 and the longest since Sabathia (seven straight) from 5/8-7/16/11…opponents batted .327 (103-for-315) against him on the road, fifth-highest average in the Majors...Opponents batted .285 (175-for-615), eighth-highest in the Majors (min. 600AB)…his .339 opponents' BABIP was the second-highest in the AL (min. 600AB), behind only Drew Hutchison (.343)…held opponents to a .244 (78-for-320) BA over his final 14 starts after they batted .329 (97-for-295) in his first 13 starts...Allowed just 10HR in 154.1IP…his 0.58 HR per 9.0IP ratio was the lowest in the AL and eighth-lowest in the Majors (min. 150.0IP)…was the third-lowest HR per 9.0IP ratio by a Yankees pitcher since 1998 (Chien-Ming Wang: 0.41 in 2007 and 0.50 in 2006)…permitted 3HR in 108.2IP over his final 19 starts beginning 5/25…did not allow a HR over a career-high eight consecutive starts from 6/16-7/26, tied for the fourth-longest homerless starts streak in the Majors in 2015…marked the longest homerless streak by a Yankees pitcher since Hiroki Kuroda (eight straight) from 7/7-8/17/13...His 7.17 run support average (154.1IP, 123RS) was the second-highest in the Majors (min. 150.0IP), this after he had the lowest RSA in the Majors in 2014 (2.70)…departed with the lead in 21 of his 27 starts…received at least 13R of support in three starts…Houston's Dallas Keuchel (twice) was the only other pitcher who received 13R more than once in 2015…was the second Yankees pitcher since 1974 to receive at least 13R in three-or-more starts in a season, joining David Wells, who had four such starts in 2002...Won 7-of-9 day starts, tied for third-most day wins in the AL...Per Fangraphs' PITCHf/x data, his fastball averaged 96.7 mph, the Major's second-highest velocity (min. 150.0IP) behind the Mets' Noah Syndergaard (97.1 mph)...Per MLB Statcast, excluding Aroldis Chapman, threw the Majors' six fastest pitches (and nine of the top 12), ranging from 101.6 to 102.4 mph...Opponents were 3-for-4 on SB attempts in 2015, one more SB than he had allowed in 2013 and 2014 combined…had a career-high streak of 33 consecutive starts without a SB snapped with Jose Altuve's SB on 6/26 at Houston (dating back to 2014)…was tied for fourth in the AL with four pickoffs...Won all seven starts vs. AL Central opponents, defeating all five clubs while going 7-0 with a 3.13 ERA (46.0IP, 16ER)…since the division was created in 1994, only three other pitchers (all Yankees) have won every start vs. the AL Central in a season while making at least seven starts: Chien-Ming Wang (8-0 in 2007), CC Sabathia (7-0 in 2012) and Roger Clemens (7-0 in 2001)...Made 16 starts following a Yankees loss (team record: 11-5)...Recorded a season-high 9K in his second start of the season on 4/15 at Baltimore…made his 6/20 start vs. Detroit on three days' rest…was the first Yankees pitcher to make a start on three days' rest following a start since Mike Mussina on 5/24/08 vs. Seattle…threw a season-high 8.0IP on 7/26 at Minnesota (8H, 2ER, 1BB, 5K) and 8/24 vs. Houston (4H, 0R, 3BB, 7K)…made his 100th career start on 7/31 at Chicago-AL...Went 1-1 with a 1.93 ERA (18.2IP, 4ER, 3BB, 20K) in five games (four starts) in spring training. Went 6-14 with a 4.37 ERA (199.2IP,97ER) in 33 starts with Miami, establishing career highs in games started, innings pitchedand strikeouts (142)... Had a run support average of 2.70, the lowest such mark in the Majors among pitchers with atleast 20 starts…had 11 starts withzero runs of support…only Ryan Vogelsong (12) had more in the Majors... Allowed 1BB-or-less in 22 of his33 starts, trailing only JordanZimmermann (25) and Bartolo Colon (24) for most such startsamong NL pitchers... Struck out a career-high 10 batterson 5/5 vs. the Mets (7.0IP)... Lost a career-high eight straightdecisions from 8/13-9/27. Started season on disabled list with right shoulder inflammation, and after coming off DL on June 18, posted 4-6 record and career-best 3.39 ERA (106.1 IP/40 ER) in 18 starts for Miami. Made five rehab starts between Single-A Jupiter and Double-A Jacksonville, going a combined 1-1 with a 4.36 ERA (20.2/10). Made first start with Miami on June 18 at Arizona, allowing two runs on three hits over 6.0 innings. Tossed at least 6.0 innings in nine of first 10 starts, going 2-2 with a 2.82 ERA (60.2/19) in that span. Held opponents to two-or-fewer earned runs in 13 of his 18 starts. Allowed career-high 11 runs, nine of which were earned, on August 16 vs. San Francisco. Allowed 12 hits in 3.0-inning outing. Despite taking five consecutive losses over an eight-start span from July 20 - August 27, held opponents to three-or-fewer runs six times, garnering just six total runs of support from offense (1.17 RSA). Over career, has lowest run support average among all Major League starters (min. 45 starts since 2011) at 2.83. Josh Johnson ranks second at 3.35. Tossed career-high 8.0 innings on September 1 at Atlanta, holding Braves scoreless on seven hits. Fared considerably better on road, going 2-2 with 2.80 ERA (54.2/17) in nine starts, compared to a 2-4 mark and 4.01 ERA (51.2/23) in nine starts at Marlins Park. Drove in first career run with a first-inning RBI single against Washington on July 12 at Marlins Park. Tied career high with eight strikeouts on August 10 at Atlanta. Began season in Dodgers' organization prior to coming to Miami in July 25 tradethat sent INF Hanley Ramirez to Los Angeles. Made nine appearances (eight starts) with Double-A Chattanooga prior to beingrecalled by Dodgers on May 29. With Lookouts, allowed more than one run in just three of eight starts, including fourruns in consecutive starts on May 2 at Huntsville and May 8 vs. Montgomery. Struck out nine in a 6.0-inning outing on April 14 at Jacksonville. Allowed two runsand five hits while walking just one. Made season debut with Dodgers against Milwaukee on May 29, allowing two runson four hits with one walk and five strikeouts in 7.0 innings. Opened campaign with season-long five-game losing streak, covering seven startsfrom May 29-June 30, which was matched later in year. Five of seven outings werequality starts, but only received three runs of support overall during skid (41.0 IP). Was receiving 1.44 runs of support per 9.0 innings at time of trade from Los Angelesto Miami, lowest mark in Majors by more than a full run (Edinson Volquez was secondat 2.59). Mark improved to 2.87 by end of season, but was still lowest in Majorsfor a pitcher making at least 22 starts. Earned win in first start with Marlins on July 28 vs. San Diego. Held Padres to onerun on five hits, while walking two and striking out five over 5.1 innings of work. Startwrapped up best month of season, finishing July with a 2-1 mark and a 2.61 ERA(20.2/6) in four starts. Set new career high with eight strikeouts on September 25 at Atlanta. Totaled 20strikeouts over final three starts, his most ever compiled over three consecutivestarts. In that same span, posted a 2.25 ERA (20.0/5). Set a career high with six walks on August 8 at Mets, but still managed to hold Mets scoreless over 5.0 innings. In five careerstarts in which he has issued four-or-more walks, has a 2-1 record and 1.23 ERA (29.1/4), and his teams are 4-1. Saw his first big league action in 2011, going 1-2 with a 3.63 ERA (14 ER/34.2 IP) in 10 games (six starts) with Los Angeles...the Dodgers went 7-3 in games that he appeared in...Set a career high with 137.2 combined innings pitched this season with Los Angeles and Double-A Chattanooga...Made six starts before being moved to the bullpen following his Sept. 3 start at Atlanta...went 1-2 with a 3.09 ERA (11 ER/32.0 IP) and limited opponents to a .225 batting average as a member of the rotation...Had his contract purchased from Double-A Chattanooga on Aug. 6 and made his big league debut that night at Arizona, picking up the win in the Dodgers' 5-3 victory...also notched the first hit of his career in his debut, singling in his first at-bat off Joe Saunders...Started his big league career by pitching at least 5.0 innings, allowing two or fewer runs and less than five hits in each of his first four starts...according to Stats, LLC, only three others since 1946 have opened their careers in similar fashion with four or more starts by that criteria: Matt Cain (6 GS, Aug. 29-Sept. 25, 2005), Felix Hernandez (4 GS, Aug. 4-20, 2005) and Dave Morehead (4 GS, April 13-May 12, 1963)...Appeared out of the bullpen for the first time on Sept. 12, 2011 with a scoreless inning against the D-backs...allowed three runs over 2.2 innings in four relief outings...Opened the season with Double-A Chattanooga and at the time of his promotion, was 6-5 and ranked second in the league a 2.63 ERA and a .203 opponents' batting average in 20 games (19 starts)...Selected as a Southern League midseason and postseason All-Star...also honored with the May Dodger Pride Award for Chattanooga, going 2-2 with a 2.70 ERA in five starts in the month...At Double-A, limited left-handed hitters to a .188 batting average, while right-handers hit just .215...averaged just under a strikeout per inning pitched with 99 strikeouts in 103.0 frames. Represented the 66ers on the California League Midseason All-Star Team...Won the May Dodger Pride Award for Inland Empire, going 1-2 with a 2.97 ERA (12 ER/36.1 IP) in six starts, including his five-hit complete game shutout on May 31 at Lancaster (Astros)...Allowed just three home runs in 98.1 combined innings...Entered the season rated as the Dodgers' No. 13 prospect by Baseball America. Registered a 1.48 ERA (11 ER/67.0 IP) over his final 16 games (nine starts) after May 21 with Single-A Great Lakes...Posted a 2.32 ERA (8 ER/31.0 IP) in 10 relief appearances...Made one postseason appearance, allowing an unearned run in 1.0 inning in Game 3 of Great Lakes' first-round series against Western Michigan. Struck out nine in 8.0 innings with the GCL Dodgers in his pro debut...Made the jump to Rookie-advanced Ogden for the final week of the season, and made one appearance, working 2.2 scoreless innings vs. Orem. 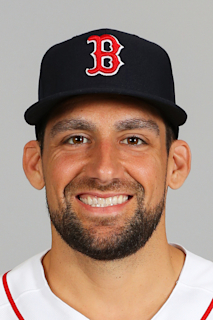 April 20, 2019 Boston Red Sox placed RHP Nathan Eovaldi on the 10-day injured list retroactive to April 18, 2019. Loose body in the right elbow. December 6, 2018 Boston Red Sox signed free agent RHP Nathan Eovaldi. October 29, 2018 RHP Nathan Eovaldi elected free agency. July 25, 2018 Tampa Bay Rays traded RHP Nathan Eovaldi to Boston Red Sox for LHP Jalen Beeks. May 30, 2018 Tampa Bay Rays activated RHP Nathan Eovaldi from the 60-day disabled list. May 23, 2018 Tampa Bay Rays sent RHP Nathan Eovaldi on a rehab assignment to Durham Bulls. May 23, 2018 Tampa Bay Rays transferred RHP Nathan Eovaldi from the 10-day disabled list to the 60-day disabled list. Loose bodies in right elbow. May 4, 2018 Tampa Bay Rays sent RHP Nathan Eovaldi on a rehab assignment to Charlotte Stone Crabs. March 28, 2018 Tampa Bay Rays placed RHP Nathan Eovaldi on the 10-day disabled list. Loose bodies in right elbow. November 2, 2017 Tampa Bay Rays activated RHP Nathan Eovaldi from the 60-day disabled list. September 13, 2017 Tampa Bay Rays sent RHP Nathan Eovaldi on a rehab assignment to Durham Bulls. September 9, 2017 Tampa Bay Rays sent RHP Nathan Eovaldi on a rehab assignment to Montgomery Biscuits. February 14, 2017 Tampa Bay Rays signed free agent RHP Nathan Eovaldi. November 23, 2016 New York Yankees released RHP Nathan Eovaldi. November 18, 2016 New York Yankees designated RHP Nathan Eovaldi for assignment. November 4, 2016 New York Yankees activated RHP Nathan Eovaldi from the 60-day disabled list. September 15, 2016 New York Yankees transferred RHP Nathan Eovaldi from the 15-day disabled list to the 60-day disabled list. Right elbow tendon injury. August 12, 2016 New York Yankees placed RHP Nathan Eovaldi on the 15-day disabled list retroactive to August 11, 2016. Right elbow tendon injury. October 7, 2015 New York Yankees activated RHP Nathan Eovaldi. October 6, 2015 New York Yankees reassigned RHP Nathan Eovaldi to the minor leagues. December 19, 2014 Miami Marlins traded RHP Nathan Eovaldi, RF Garrett Jones and RHP Domingo German to New York Yankees for RHP David Phelps and 3B Martin Prado. June 18, 2014 Miami Marlins activated RHP Nathan Eovaldi from the paternity list. June 15, 2014 Miami Marlins placed RHP Nathan Eovaldi on the paternity list. June 18, 2013 Miami Marlins activated RHP Nathan Eovaldi from the 60-day disabled list. June 4, 2013 Miami Marlins sent RHP Nathan Eovaldi on a rehab assignment to Jacksonville Suns. May 25, 2013 Miami Marlins sent RHP Nathan Eovaldi on a rehab assignment to Jupiter Hammerheads. April 18, 2013 Miami Marlins transferred RHP Nathan Eovaldi from the 15-day disabled list to the 60-day disabled list. Right shoulder inflammation. March 31, 2013 Miami Marlins placed RHP Nathan Eovaldi on the 15-day disabled list retroactive to March 24, 2013. Mild right shoulder inflammation. July 27, 2012 Miami Marlins activated RHP Nathan Eovaldi. July 25, 2012 Miami Marlins traded LHP Randy Choate and SS Hanley Ramirez to Los Angeles Dodgers for RHP Nathan Eovaldi and RHP Scott McGough. May 29, 2012 Los Angeles Dodgers recalled Nathan Eovaldi from Chattanooga Lookouts. April 30, 2012 Los Angeles Dodgers optioned Nathan Eovaldi to Chattanooga Lookouts. April 27, 2012 Los Angeles Dodgers recalled Nathan Eovaldi from Chattanooga Lookouts. April 4, 2012 Los Angeles Dodgers optioned Nathan Eovaldi to Chattanooga Lookouts. August 6, 2011 Los Angeles Dodgers selected the contract of Nathan Eovaldi from Chattanooga Lookouts. April 5, 2011 Nathan Eovaldi assigned to Chattanooga Lookouts from Rancho Cucamonga Quakes. February 28, 2011 RHP Nathan Eovaldi assigned to Los Angeles Dodgers. September 23, 2010 Inland Empire 66ers activated RHP Nathan Eovaldi from the 7-day disabled list. September 1, 2010 sent RHP Nathan Eovaldi on a rehab assignment to Ogden Raptors. August 20, 2010 sent RHP Nathan Eovaldi on a rehab assignment to AZL Dodgers. March 22, 2010 RHP Nathan Eovaldi assigned to Inland Empire 66ers from Great Lakes Loons. June 25, 2009 Nathan Eovaldi assigned to Great Lakes Loons from Ogden Raptors. June 23, 2009 RHP Nathan Eovaldi roster status changed by Ogden Raptors. June 21, 2009 RHP Nathan Eovaldi assigned to Ogden Raptors from Great Lakes Loons. April 8, 2009 Nathan Eovaldi assigned to Great Lakes Loons from Ogden Raptors.